The UC College of Medicine houses a number of research core facilities designated as core service centers. These facilities exist within multiple departments but are collectively supported by the College of Medicine, Office of Research through the Associate Dean for Research Core Facilities: Ken Greis, PhD. (ken.greis@uc.edu; Tel: 515-558-7012). The service center designation signifies that the rates charged by each of these facilities have been reviewed and approved by the UC government cost compliance office, thus the service fees can be cross-charged to federal grants and contracts. Details related to the services offered and the internal rates for each of the cores are provided below. Since these rates are substantially subsidized by the University, external investigators should contact individual core directors to get a rate quote. 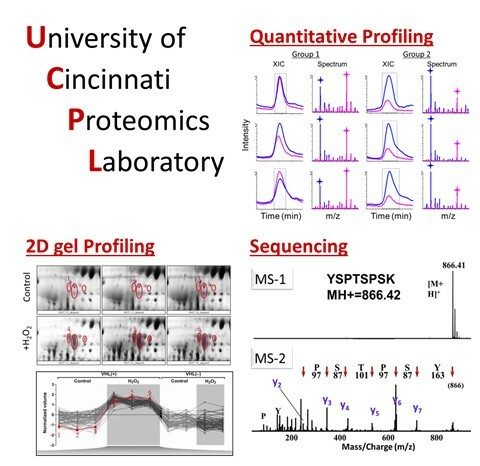 The UC Proteomics Laboratory (UCPL) is committed to providing collaborative expertise & services in proteomics & biological mass spectrometry both as fee-for-service and as grant supported partnerships. The UCPL is located in the Vontz Center for Molecular Studies 1208-1216. Staff are typically available M-F, 9A-6P to accept samples, but please call 513 558-4057 to confirm. First time customers should include a discussion with the director or associate director prior to preparing samples. Mass spectrometry data were collected and analyzed in the UC Proteomics Laboratory under the direction of KD Greis, PhD. 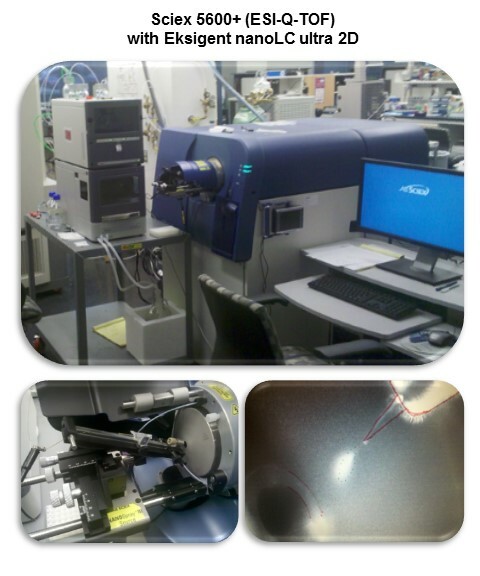 Funding for the nanoLC-MS/MS system was obtained in part through an NIH shared instrumentation grant (S10 RR027015-01). Specific instrumentation and facilities information for your grant submission will be supplied by the core director. Please contact the core director at least two weeks before the grant is due to ensure proper alignment of the core infromation with in your grant needs. MS/MS fragmentation can be used to confirm peptides sequences and sites of modification. Shown here is an example of mapping phosphorylation (left) and a covalent-enzyme inhibitor (right). Proteins can be separated by 2D gels and visualized by silver-stain (left). Coupled with image analysis, protein changes among sample groups can be determined. Protein digestion and mass spectrometry-based sequencing (middle) coupled with database searching (right) can be used to identify the proteins. Electrospray-Tof MS can be used to get accurate masses of intact proteins or mixtures of proteins. In this example, accurate mass measurements confirm the various standard fragments of a monoclonal antibody as well as the distribution of the glycoforms on the Fc/2 fragment for QA of a therapeutic antibody. MALDI-MS can be used to measure the conversion of a substrate to a product. In this case a peptide converted to a phosphorylated peptide by a kinase (left). With increasing concentrations of an inhibitor, the degree of inhibition and ultimately the IC50 value for the inhibitor can be measured (right). HTS applications are possible as these measurements can be made in a few seconds per sample. Relative levels of proteins from multiple sample groups can be evaluated as a single sample after digestion of the proteins and tagging with MS/MS reporter reagents (iTRAQ) followed by nanoLC-MS/MS for protein identification (left). The relative amount of each peptide is determined by the ratio of the reporter tags (114, 115, 116, 117). A table of the significant up- and down-regulated urine proteins in steroid resistant nephronic syndrome (right). This instrument offers the hybrid capabilities for high resolution and high sensitivity profiling, characterization of compounds in complex mixtures, and also high selectivity and sensitivity for quantitation of compounds in complex mixtures by monitoring fragmentations transitions either in selected reaction monitoring (SRM) or multiple reaction monitoring (MRM) modes. 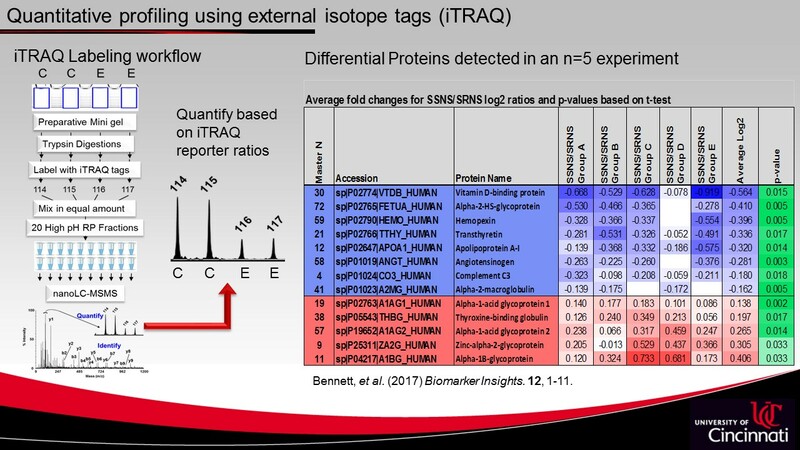 With attomole sensitivity, this system is optimized for both quantitative proteomics profiling using either label free or isotope tagging methods (e.g. SILAC, iTRAQ) and quantitation of specific proteins (as peptide surrogates) from complex mixtures. 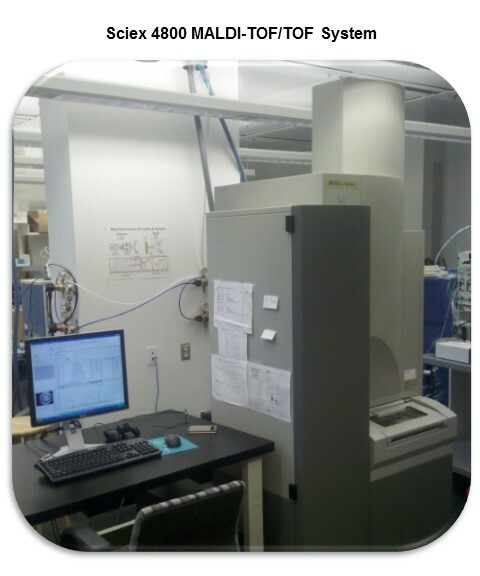 The 4800 instrument is the primary instrument in the proteomics laboratory used for core services that require protein identification from single bands or spot from gels. The attomole sensitivity and high repetition laser for fast data collection make it the ideal option for protein identification including protein complexes captured by affinity methods. 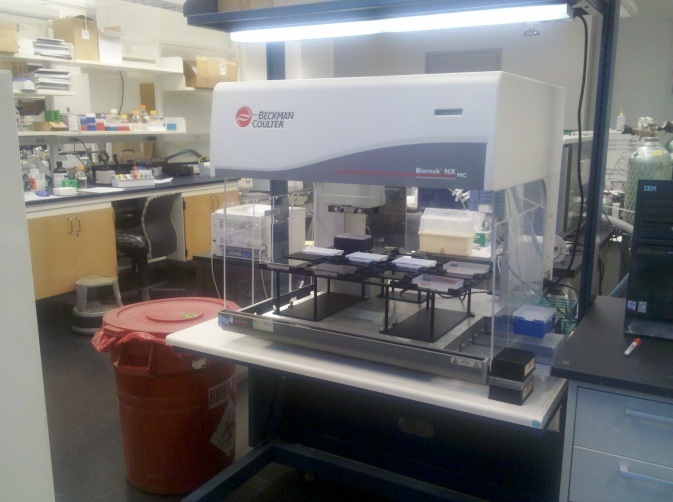 This instrument is also the primary system used for the rapid readout of enzyme assays and inhibitor screening studies. This system is use for samples preparation of enzyme reactions for MS-bases screening activities. 10 terrabyte general file server for automatic backup and archival of all proteomics data and reports. 8-processor MASCOT server for high throughput identification and quantification of proteins. 1. How do I submit a sample for analysis. 2. How much protein do I need to identify it my mass spectrometer? We can identify a protein by trypsin digestion and mass spectrometry from as little as a few fmoles of a purified protein. From a 1D gel, considering the losses that one takes in the digestion and recovery of peptides from the gel, we can often identify most proteins that are distinctly visible with a MS-compatible silver stain. For 2D gels this is a bit trickier since the protein gets concentrated into such a small spot that sometimes we get a nicely detected protein spot that just does not liberate sufficient peptides after digestions for identification. The truth is that it is very dependent on the structure and sequence of the protein. 3. I have heard that protein ID from a silver stained gel is not feasible, is this true? The answer is NO. As indicated above, we routinely identify protein from silver-stained gels; however, there are a couple precautions that need to be followed. First, one must use an MS-compatible silver-stain. There are a number of commercial staining kits marketed as MS-compatible and to our knowledge they all work. You can still make your own reagents; you just have to eliminate steps that include glutaraldehyde fixation because glutaraldehyde crosslinks the proteins and makes it very difficult to recover peptides from the gel. A second concern is that one must take extreme care to avoid handling the gels, reagents and/or stains without gloves for fear of introducing keratin contamination (see FAQ 7) which can mask the detection of low level proteins. 4. I have a protein that gives a nice band by western blot; can I identify it my MS? Like many questions, the answer here depends on a number of factors. First, one must keep in mind that detection with antibodies and chemiluminescence reagents only require a few hundred molecules (of course depending on the quality and specificity of your antibody). To detect proteins at the low femtomole range by MS requires about 1 billion molecules. Thus a protein readily detected by Western blot may not be in sufficient quantities to identify by MS. Furthermore, antibody detection is typically used on complex protein mixtures because there is no need to purify the protein of interest prior to Western blot to get good signals. Unfortunately if the target protein is buried under a number of more abundant proteins at the same mobility position on the gel, then these more abundant proteins may mask the MS-detection and identification of the protein of interest. Having said all this, we and others have been most successful at identifying proteins that interact with antibodies by using immobilized antibodies to enrich for your protein of interest (see FAQ 5 for details). When done correctly this has two advantages; first, one selectively enriches for the protein(s) of interest, and secondly, the protein(s) can be eluted from the immobilized antibody without releasing the Ig heavy and light chains thus minimizing interference on the gel and mass spectrometer. 5. What about protein identification from immunoprecipitations? IPs, like western blots, can be a bit tricky, but can be effectively coupled with mass spectrometry to identify the target protein and other proteins that interact with the target protein. The key here is that you must remember that the most abundant protein in an IP will be your antibody, thus when you run the resulting pull-down on a gel, you will get huge bands for the Ig heavy and light chains that often mask the protein(s) of interest. This is a more difficult challenge for polyclonal antiserum since you not only have your antibody of interest, but also all other antibodies in the serum. In all cases, the best success is achieved by immuno-enriching your Ig of interest then immobilizing it on a resin. That way you can capture and elute your protein(s) of interest without liberating the interfering heavy and light chains. We have identified interacting protein in a number of biological systems for several investigators using these methods. One final note here; Ig purification, generation of the immobilized column and collection of the enriched fractions are all functions carried out in the investigators laboratory. The proteomics lab personnel generally take over just before or after running the 1D gel. Consult the Proteomics Director for additional details. 6. I think my protein has modifications; can you identify all of the sites? Mass spectrometry is an ideal tool for mapping sites of post-translational modifications (PTM); however, the success will depend on the type of modification, the amount of protein available, the purity of the protein, the sequence of the protein, and the stoichiometry of the modification. I'll use phosphorylation as an example since it represents the majority of inquiries. Let's say we have a protein that we know is phosphorylated (e.g. antibody reactivity (+/-) phosphatase treatment) and we would like to know what sites are modified. First, we will need enough protein (generally low µg amounts) of sufficient purity to digest and recover peptides containing potential sites of modification. This is often the most difficult task when working with low level regulatory proteins. Secondly, the phosphorylation at a given site of the protein must be of sufficient abundance to be detected. In other words, if our limit of detection for peptides is 5 fmole and your stoichiometry of phosphorylation at a given site is 10% occupancy, then we would need a minimum of 50 fmoles of total peptide to even have a change to identity the phosphopeptide or site of phosphorylation. Adding to this challenge is the fact the phosphopeptides are generally more difficult to detect and sequence compare to un-modified peptides due to ionization efficiency issues, thus you may need to have 20-50X more material to detect and sequence a phosphopeptide at a 10% occupancy rate compared than its un-modified counterpart. Lastly, this may be obvious, but I get this question all the time, "You found two sites of phosphorylation, so can I report that they are the only sites modified under my conditions?" The answer here is a resounding NO! The mass spectrometer can only positively confirm a modification, it cannot completely rule out other modifications that go undetected. If the sequence of the protein is such that a site of modification is liberated as a tryptic peptide that is outside the mass range of the instrument (generally below 600Da or above about 4000Da) then it will go undetected. Furthermore, an undetected site of modification may just have a stoichiometry that is below our current detection limits. Thus we can only report what is detected in the mass spectrometry. Having said all this, we have successfully identified various sites of modification including phosphorylation. We have a number of methods to enrich for phosphopeptides to increase our chances of success, but we may have to start with µg amounts of a fairly pure protein. 7. My results had lots of keratin contamination; what does this mean? 8. Why did I get multiple proteins identified from one band; can you tell me which is more abundant? It is not uncommon to get multiple proteins identified from a single band from a 1D gel. Even with the resolving power on 2D gels, we often detect more than one protein in these samples. This occurs both because of the sensitivity of the mass spectrometer and the fact that sometimes more than one protein has the same or very similar migration properties. The good news is that in most cases, we can provide a pretty good idea about which protein is most abundant in the sample based on the signal intensity of the peptides from each of the proteins. While this is far from an exact measurement (since extraction efficiencies of peptides from the gel and ionization efficiencies in the mass spectrometer can confound the issue) in most cases we have sufficient data to inform the investigator which of the proteins identified accounted for the majority of the material detected in the gel by the staining protocol. Heaven MR, Funk AJ, Cobbs AL, Haffey WD, Norris JL, McCullumsmith RE, Greis KD. Systematic Evaluation of Data-Independent Acquisition for Sensitive and Reproducible Proteomics - a Prototype Design for a Single Injection Assay. (2016) J Mass Spectrom, 51, 1-11. Thowfeik FS, AbdulSalam SF, Wunderlich M, Wyder M, Greis KD, Kadekaro AL, Mulloy JC, Merino EJ. A ROS-activatable agent elicits homologous recombination DNA repair and synergizes with pathway compounds. (2015) Chembiochem. 16, 2513-2521. Wijeratne AB, Wijesundera DN, Paulose M, Ahiabu IB, Chu W-K, Varghese OK and Greis KD. Phosphopeptide Separation Using Radially Aligned Titania Nanotubes on Titanium Wire. (2015) ACS Applied Material & Interfaces 7, 11155-11164. Huang Y, Powers C, Madala SK, Greis KD, Haffey WD, Towbin J, Purevjay E, Javadov S, Strauss AW, Khuchua Z. Cardiac metabolic pathways affected in Barth syndrome: The altered mitochondrial proteome in Barth syndrome. (2015) PlosONE | DOI:10.1371/journal.pone.0128561 June 1, 2015. Marsh JM, Davis MG, Flagler MJ, Sun Y, Chaudhary T, Mamak M, McComb DV, Williams R, Greis KD, Rubio L, Coderch L. Advanced hair damage model from ultra-violet radiation in the presence of copper. (2015). Int'l. J. Cosmetic Sci. 37(5), 532-541. Lu X, Zoller EE, Weirauch MT, Wu Z, Namjou B, Williams AH, Ziegler JT, Comeau ME, Marion MC, Glenn SB, Adler A, Shen N, Nath SK, Stevens AM, Freedman BI, Tsao BP, Jacob CO, Kamen DL, Brown EE, Gilkeson GS, Alarcón GS, Reveille JD, Anaya JM, James JA, Sivils KL, Criswell LA, Vilá LM, Alarcón-Riquelme ME, Petri M, Scofield RH, Kimberly RP, Ramsey-Goldman R, Joo YB, Choi J, Bae SC, Boackle SA, Graham DC, Vyse TJ, Guthridge JM, Gaffney PM, Langefeld CD, Kelly JA, Greis KD, Kaufman KM, Harley JB, Kottyan LC. Lupus Risk Variant Increases pSTAT1 Binding and Decreases ETS1 Expression. (2015) Am J Hum Genet. 96, 731-9. Hasegawa K, Sin H-S, Broering TJ, Kartashov AV, Ichijima Y, Zhang F, Greis KD, Andreassen PR, Barski A, Namekawa SH. Scml2 establishes the germline-specific epigenome through regulation of histone H2A ubiquitination. (2015) Dev Cell. 32(5); 574-88. Liou B, Haffey WD, Greis KD, Grabowski GA. Characterization of the LIMP-2/SCARB2 Ligand on Acid ?-Glucosidase, the Defective Enzyme in Gaucher Disease. (2014) J. Biol. Chem. 289 (43), 30063-74. Wijeratne AB, Manning JR, Schultz JEJ, Greis KD. Quantitative phosphoproteomics using acetone-based peptide labeling: Method evaluation and application to a cardiac ischemia/reperfusion model. (2013) J. Proteom. Res. 12(10):4268-4279. Marsh JM, Iveson R, Flagler MJ, Davis MG, Newland AB, Greis KD, Sun Y, Chaudhary T, Aistrup ER. Role of Copper in Photochemical Damage to Hair. (2014) Int'l. J. Cosmetic Sci. 36, 32-38. Smith EA, Krumpelbeck EF, Jegga AG, Prell M, Matrka MM, Kappes F, Greis KD, Ali AM, Meetei AR, Wells SI. The nuclear DEK interactome supports multifunctionality (2017) Proteins, DOI 10.1002/prot.25411. In Press. Green JV, Orsborn KI, Long JL, Zhang M, Queenie K.-G. Tan QK-G, Greis KD, Porollo A, Andes DR, Hostetter MK. Heparin Binding Motifs and Biofilm Formation by Candida albicans (2013) J. Infect. Diseases. 208(10):1695-1704. Kattamuri C, Luedeke DM, Nolan K, Rankin SA, Greis KD, Zorn AM, Thompson TB. Members of the DAN Family are BMP Antagonists That Form Highly Stable Noncovalent Dimers. (2012) J. Mol. Biol. 424(5):313-327. Gauthamadasa K, Vaitinadin NS, Greis KD, Macha S, Dressman JL, Silva RAGD. Apolipoprotein A-II mediated conformational changes of Apoliprotein A-I in discoidal high density lipoproteins. (2012) J. Biol. Chem. 287 (10), 7615-7625. Govindan S, McElligott A, Muthusamy S, Nair N, Barefield, D, Greis KD, Martin JL, Gongora E, Luther PK, Winegrad S, Henderson KK, Sadayappan S. Cardiac myosin binding protein-C is a potential diagnostic biomarker for myocardial infarction. (2011) J. Molec. Cell. Cardiology, 52, 154-164. Piyaphanee N, Ma Q, Kremen O, Czech K, Greis KD, Mitsnefes M, Devarajan P, Bennett MR. Discovery and initial validation of alpha 1-B glycoprotein fragmentation as a differential urinary biomarker in pediatric steroid resistant nephrotic syndrome (2011). Proteomics-Clinical Applications, 5, 334-342. Myer DL, Robbins SB, Yin M, Boivin GP, Liu Y, Greis KD, Bahassi EM, Stambrook PJ. Absence of polo-like kinase 3 in mice stabilizes Cdc25A after DNA damage but is not sufficient to produce tumors. (2011) Mutation Research, 714, 1-10. Linares JF, Amanchy R, Greis K, Diaz-Meco MT, Moscat J. Phosphorylation of p62 by cdk1 Controls the Timely Transit of Cells through Mitosis and Tumor Cell Proliferation (2011). Mol. Cell. Biol. 31(10), 2171. Correction of 31(1), 105-117. Djung JF, Mears RJ, Montalbetti C, Golebiowski A, Carr AN, Barker O, Greis KD, Zhou S, Dolan E, Davis GF. The Synthesis and Evaluation of Indolylureas as PKC? Inhibitors (2011) Biorg. Med. Chem. 19, 2742-2750. Greis KD. Can mass spectrometry transform the way we do HTS of isolated enzymes? (2010) SBS News, 44, 4. Ridsdale R, Na C-L, Xu Y, Greis KD, Weaver TE. Comparative proteomic analysis of lung lamellar bodies and lysosome-related organelles (2011) PLoS ONE, 6, e16482. Bennett MR, Pleasant L, Haffner C, Ma Q, Haffey WD, Ying J, Wagner M, Greis KD, Devarajan P. A Novel Biomarker Panel to identify Steroid Resistance in Childhood Idiopathic Nephrotic Syndrome (2017) Biomarker Insights. 12, 1-11. Rathore R, Corr JJ, Pribil P, Seibel WL, Evdokimov A, Greis KD. Multiplexed Enzyme assays for Inhibitor Screening via Mass Spectrometry. (2010) J. Biomolec. Screen., 15, 1001-1007. Rathore R, Corr JJ, Lebre DT, Seibel WL, Greis KD. Extending MALDI-QqQMS Enzyme Screening Assays to Targets with Small Molecule Substrates. (2009) Rapid Commun. Mass Spectrom. 23, 3293-3300. Stella CL, Bennett MR, Devarajan P, Greis KD, Wyder M, Macha S, Rao M, Jodicke C, Moussa H, How HY, Myatt L, Webster RP, Sibai BM. Preterm Labor Biomarker Discovery in Serum Using 3 Proteomic Profiling Methodologies. (2009) Am. J. Obstet. & Gynecol., 201,387.e1-13. Aslan JE, You H, Williamson DM, Endig J, Youker RT, Thomas L, Shu H, Du Y, Milewski RL Brush MH, Possemato A, Sprott K, Fu H, Greis KD, Runckel DK, Vogel A, Thomas G. Akt and 14-3-3 control a PAC-2 homeostatic switch that integrates membrane traffic with TRAIL-induced apoptosis. (2009) Molec. Cell, 34, 497-509. Suzuki M, Wiers K, Brooks EB, Greis KD, Haines K, Klein-Gitelman MS, Olson J, Onel K, O'Neil KM, Silverman ED, Tucker L, Ying J, Devarajan P, and Brunner HI. Initial Validation of a Novel Protein Biomarker Panel for Active Pediatric Lupus Nephritis. (2009) Pediatric Research, 65, 530-536. Eismann T, Huber N, Shin T, Kuboki S, Galloway E, Wyder M, Edwards MJ, Greis KD, Shertzer HG, Fisher AB, Lentsch AB. (2008) Peroxiredoxin-6 Protects Against Mitochondrial Dysfunction and Liver Injury During Ischemia/Reperfusion in Mice. Am J Physiol Gastrointest Liver Physiol. 296(2), G266-74. Greis KD (2007) Mass Spectrometry for Enzyme Assay and Inhibitor Screening: Emerging Applications in Pharmaceutical Research. Mass Spectrom Rev. 26, 324-339. Fang J, Bolanos L, Choi K-M, Liu X, Christie S, Akunuru S, Kumar R, Figueroa ME, Greis KD, Stoilov P, Filippi M-D, Maciejewski JP, Garcia-Manero G, Weirauch MT, Salamonis N, Geiger H, Zheng Y, Starczynowski DT. Ubiquitination of hnRNPA1 by TRAF6 links chronic innate immune signaling to myelodysplasia (2017) Nat. Immunol. 18(2), 236-245. Kirley TL, Greis KD, Norman AB. Selective disulfide reduction for labeling and enhancement of Fab antibody fragments. (2016) Biochem Biophys Res Comm. 480(4), 752-757. Dwivedi P and Greis KD. Granulocyte Colony Stimulating Factor Receptor (G-CSFR) signaling in severe congenital neutropenia, chronic neutrophilic leukemia and related malignancies (2017) Exp. Hematol.46, 9-20. Kirley TL, Greis KD, Norman AB. Structural characterization of expressed monoclonal antibodies by single sample mass spectral analysis after IDeS proteolysis. (2016) Biochem Biophys Res Comm. 477, 363-368. Sedlacek CJ, Nielsen S, Greis KD, Haffey WD, Revsbech NP, Ticak T, Laanbroek HJ, Bollmann A. The effect of bacterial community members on the proteome of the ammonia-oxidizing bacterium Nitrosomonas sp. Is79. (2016) Applied and Environmental Microbiology. 82(15), 4776-4788. Blanco VM, Chu Z, LaSance K, Gray GD, Pak KY, Rider T, Greis KD, Qi X. Optical and nuclear imaging of glioblastoma with phosphatidylserine-targeted nanovesicles. (2016). Oncotarget, 7(22), 32866-32875.